Brighton and Sussex University Hospital NHS Trust (BSUH) is currently undertaking an ambitious redevelopment programme to modernise the Royal Sussex County Hospital in Brighton, to ensure the best possible care for patients over the coming decades. It will achieve this by replacing some of the oldest buildings still in clinical use with state-of-the-art healthcare facilities, including an improved cancer centre and inpatient accomodation. Willis Newson have been working on the project with BSUH since 2010 and is now leading on the delivery of the 3Ts Public Art Strategy, the theme of which is ‘Connect’. The art programme will foster connections - between the Hospital and the neighbourhoods, towns, villages and landscapes of Brighton and Sussex, between people, between communities, between hospital departments, between the past heritage and present achievements of Brighton and Sussex University Hospitals NHS Trust - in order to encourage a sense of belonging and community. 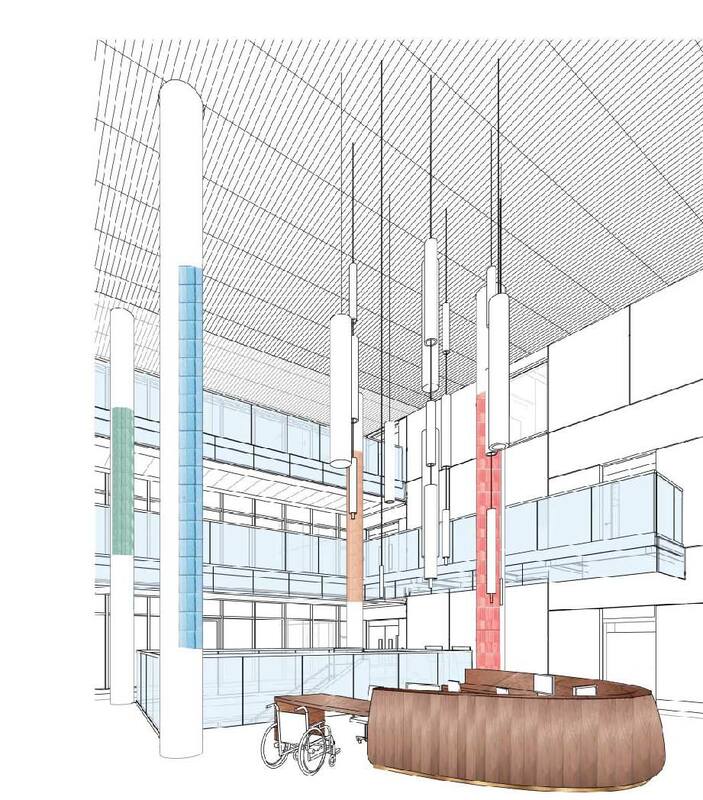 The use of art within the 3Ts development will help create a therapeutic environment that supports the social, emotional, psychological and physical needs of patients and staff and which connects the hospital to the communities it serves. The new buildings will not only provide exceptional clinical care, they will also be an environment which maximises patient recovery and improve the experience for visitors and carers. The work is starting with commissions which need early integration into the programme of building works. These include artworks by Sharon Ting for the Sanctuary space, Marion Brandis for the Sky Gardens and Kate Blee for the Welcome space (see artist's impression above). Part of the art strategy is an ambitious wayfinding project engaging 14 different local and emerging artists in providing illustrations to identify key junctions and points of arrival across the hospital. This will enable the Trust to achieve their aim to help make it easy for people to find their way around the building, as well as creating a distinctive sense of place. The core values of BSUH are; Communication, Kindness and Understanding, Fairness and Transparency, Working Together and Excellence. The Public Art Programme will support the Trust to translate those values into the fabric of their new building, creating a welcoming space which ensures patients and staff feel supported and cared for.